Every time when you install any software , or copy any file to hard drive or deleting any data from the hard drive, it ends up in clutter which is remained stored in multiple locations of hard drive, resulting in Disk Fragmentation. Defragmentation helps to reduce this clutter and removes the fragmentation and restores all the data to a healthy state. There are many softwares used for defragmentation of hard drive, there is an in-built Windows defragmentation utility allows to defrag the whole drive, This process takes many hours to complete and process is very tidy to do. To save time, we can use Piriform's Defraggler. Defraggler lets you to choose one or more files, folders, or the whole drive to defragment. To use Windows default defrag utility, right click on drive icon in ‘My computer’ window and select ‘properties’ option. 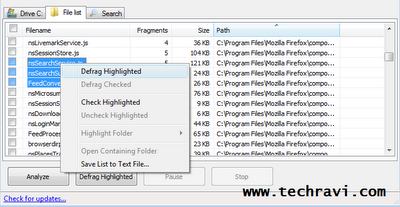 Then click on ‘Tools’ tab and check for defragmentation option. It not only defrags but also organizes empty disk space to further prevent fragmentation.It is a very small utility and compatible to all operating systems including Windows 7, windows vista & windows xp.